You will change the face angle of the clubhead by manipulating the shaft, and only with some adjustable sole protrusion pieces, will you change the loft angle, but in doing so you change the face angle at the same time. You can definitely change the lie angle and the face angle by changing the angle of the shaft, but you simply cannot change the loft of the clubhead through a change in the angle of the shaft using such an adjustable driver hosel device. Wow, that’s a lot of negative to that $400 adjustable driver isn’t it? We will attempt to explain further of what we think of these adjustable drivers that all of the O.E.M.s are marketing.
" YOU CANNOT CHANGE LOFT "
The most widely used machine for clubhead specifications measurement is the device shown in the image below. 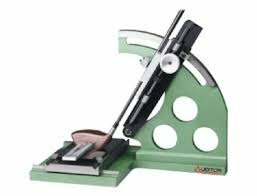 More commonly known in the golf equipment industry as “the Green Machine”, this device has been used by virtually every clubhead production factory and golf equipment company to measure LOFT, LIE, FACE ANGLE and FACE PROGRESSION since the early 1980’s. Manufactured by Tecnorama Ltd. Of Koahsiung, Taiwan, the Green Machine is considered the industry standard for clubhead specifications measurement. CONCLUSION: The measurements were performed using the accepted manner of positioning a driver head for accurate loft, lie and face angle measurement as practiced for many decades by many clubhead production factories. I was amazed at how far off these measurements for static loft, lie and face angle specifications were from each company’s stated specifications. I can assure you they were quite mind-blowing. The entire history of driver fitting has always been based on choosing the driver head to have specific static loft and face angle specifications that when subjected to the golfer’s swing characteristics will result in a particular shot result for each golfer. It is the golfer’s swing path, hand position, and angle of attack that dictates how the static clubhead specifications will translate into the shot result. The clubhead’s static specs, when subjected to the swing characteristics of the golfer, dictates a significant part of what the shot result will be. 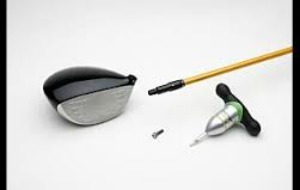 The best golf clubs for any golfer will be built with clubheads which possess static specifications which have been determined by the golf company and/or an experienced clubfitter to be able to produce the most consistent shot results when subjected to the swing characteristics of each golfer. If a golfer cannot rely on the static specifications of the clubhead to be what they are stated to be, achieving the most consistent shot results becomes a very-disorganized trial and error process. 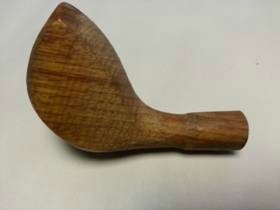 The origin for the manner in which the modern adjustable hosel devices are able to change woodhead specifications comes from the era of wooden head manufacturing. 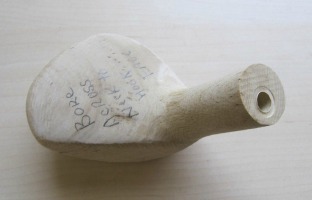 In the time when woodheads were made from trees, the lie angle and face angle of the woodhead were created by drilling the hosel bore into the neck of the raw wooden turning. 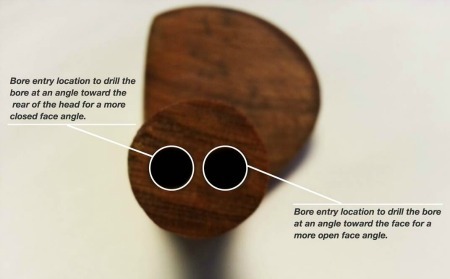 If a different lie or face angle was required, the bore would be drilled at a different angle to the plane of the sole. The technique was referred to as "cross-boring the hosel". What you cannot do through changing the angle of the bore into the head is to change the loft of the woodhead. In no way can the loft of a woodhead be changed by changing the angle of the shaft/bore into the head. To change loft on the wooden heads, raw turnings of different loft had to be made, or, skilled workers would carefully file the wooden face to increase or decrease the loft. When the angle of the shaft/bore into the head was changed, the lie angle, the face angle or both together can be changed, but the loft cannot be changed, This is because when the head is placed on the specs measurement machine, the head is still positioned to sit on the major flat surface of the sole. A different lie angle certainly can be achieved, so too a different face angle. But no matter how you angle the shaft bore into the head, the static loft remains the same as it was on the original turning. The adjustable hosel devices in use in the golf industry are all designed to work in the same manner as a change in the drilling of the bore angle in a wooden head. The hosel is designed larger in diameter to accommodate both the shaft and the adjustable device. The adjustable hosel device in which the shaft is inserted is designed so its bore is at an angle to the outside of the device. Thus when the entire device with shaft installed is rotated, the angle of the shaft is changed with respect to the ground line of the sole plane from face to back - similar to how the bore is drilled at an angle in a wooden head to achieve a different lie and face angle. How much this angle of the shaft in the adjustable hosel device can be altered depends on how large the hosel is made so as to be able to accommodate a greater off bore angle in the adjustable device. WHAT ABOUT THE SHAFT SPLINE???? Proper driver fitting involves customizing 12 different driver specifications so they best match each golfer’s combination of size, strength, athletic ability and swing characteristics. The adjustable hosel drivers allow golfers to modify #3 and #4 only from the above list, but only in a very narrow range of +/-1.5 to 2 degrees at the most. You can choose between 2 or 3 flexes in that one shaft model and you probably can choose between 3 loft options. Beyond that, the adjustable driver still has one and only one length, shaft weight, shaft bend profile, total weight, swingweight, grip model, grip size, and clubhead design. On the other hand, if you work with a professional Clubmaker, you can have all 12 key specs fit to your swing, and each one can be fit to a far wider range of fitting options. 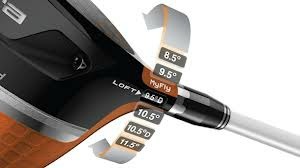 · Shaft Flex can be anything between a shaft for a sub 50mph golfer all the way up to a shaft for a >125mph golfer. And the driver head model can come from a myriad of different size, shape, CG, MOI, face design, and color options. Here at Golfclub-technology.com, we use Tom Wishon driver heads as they can be custom ordered. Any TWGT original driver head clubhead can be individually selected, then checked/measured to meet precise requirements for LIE, and/or FACE ANGLE, and Loft. In the end, it is up to each golfer to decide. But if the goal of spending $300-$500 on a driver, is to get the driver that performs the absolute best for every golfer, it is a no brainer to go find a good custom clubmaker who can and will fit your swing for each and every one of the key fitting specifications. Not just a handful for a limited range of fitting options.